A parliamentary report of 1777 listed Cheltenham as having a workhouse in operation for up to 36 inmates. In 1809, a new purpose-built workhouse opened in the town on what is now Knapp Lane. In 1826, a new workhouse opened on Winchcomb Lane, Prestbury. The following year, Charlton Kings opened a workhouse which was used to house pauper children. A parish workhouse also operated at Coberley. Coberley former parish workhouse, 2003. The population falling within the Union at the 1831 census had been 29,882 — ranging from Up Hatherley (population 21) to Cheltenham itself (22,942). The average annual poor-rate expenditure for the period 1833-35 had been £5,770 or 3s.10d. per head of the population. Initially, the new union continued to use the existing town workhouse on Knapp Lane which cold hold around 150 inmates. The old Knapp Lane workhouse continued in operation until around 1850, after which the property was sold and in 1856 the Parish Church National and Infant Schools were built on the site. 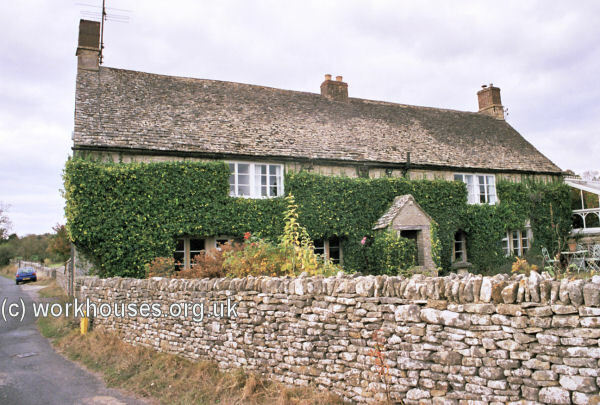 A new union workhouse was ertected in 1838-41 on Swindon Road at the north-west of Cheltenham. It was designed by a Mr Cope and had an unusual K-shaped layout, a variation on the Poor Law Commissioners' model Y-plan. Its location and layout are shown on the 1932 map below. In November 1874, an official inquiry was held at the workhouse into a large number of charges brought against the master and matron of the establishment, Mr and Mrs Welch, namely that they had: inflicted punishment without reporting to the guardians; been absent from house after hours; not visited the men's wards at night; not reported property possessed by deceased paupers; misappropriated property of the guardians; scalded the milk and kept a number of fowls; fed visitors from the workhouse supplies; disposed of lard, and not accounted for money received from the sale of rags and bones; improperly cut up the pigs and kept the best joints preserved; given lumps of fat, cow's udder, lights and pipes to the paupers; used burnt sugar to colour the beef tea; failed to report complaints; bullied the inmates; allowed drunkenness in the house; permitted the officers to not dine together; and given out the officers' rations for the whole day. A subsequent report on the proceedings from the Local Government Board accepted that many of the charges had been proved. Accordingly, the Board of Guardians demanded the immediate resignations of the master and matron. In 1882, the Board of Guardians acquired 'The Elms', a property bordering the eastern side of the workhouse, as a home for pauper children. Popes Close now stands there. 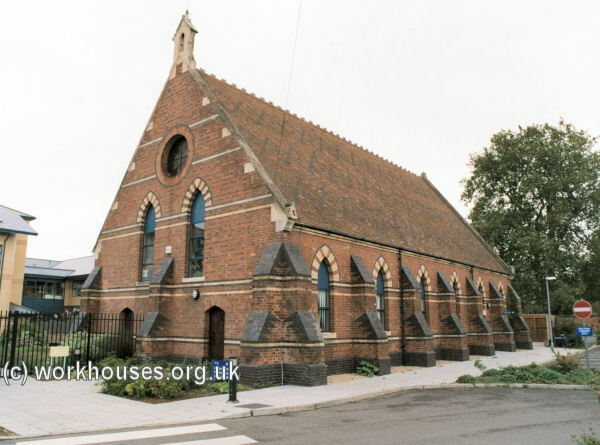 A chapel was erected at the south of the workhouse in about 1886. At around the same time, a casuals' ward block was located at the north of the site. A new infirmary complex was built at the east of the workhouse in around 1890. Cheltenham chapel from the south-west, 2001. The workhouse later became St Paul's Hospital but this was demolished in the late 1990s, with only the chapel and a small outbuilding at the western edge of the site surviving. In more recent times, the site has occupied partly by housing and partly by various health care services. 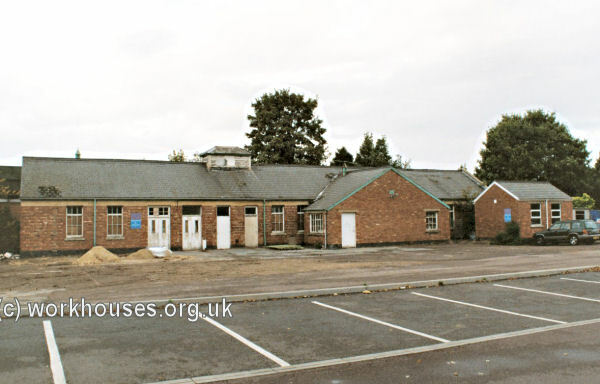 Cheltenham outbuildings from the east, 2001. In the early 1900s, the Cheltenham Union established a children's home known as The Elms on Swindown Road, adjacent to the workhouse. It could house up to 100 children. Gloucestershire Archives, Clarence Row, Alvin Street, Gloucester GL1 3DW. Holdings include Guardians' minute books (1835-1930); Admissions and discharges (1835-1941, with gaps); Births (1836-56, 1908-14); Deaths (1836-51); Register of inmates (1900-35); Children's home admissions and discharges (1915-38); etc.